Ascension Art Glass was created to reflect my personal life shift to a higher self and still be in service to others within the collective. Ascending is my process of increasing my personal Enlightenment/Consciousness. Moving away from the negative energies of the unconscious and transcending to a Light heart continues to be my goal. As Guy Finley writes: Living for the Allness and not the smallness of Life. My name is Steve Claypatch. I left a 'regular' job in 2005 at the age of 53. Leaving a six figure paycheck one day, to having zero (0) income was freightening. I found myself enjoying a new found love for art. Never having been at a art show, gallery or museum in my life, I had no idea of the satisfaction there was in creating. Since then, I have strived to be a professional glass blower. I have created and sold my work at art shows and galleries. My work primarily consists of blown utilitarian vessels, and glass memorials ( or urns). In 2015, I acquired a German Engraving Lathe. The lathe allows me to design glass after it is cooled. 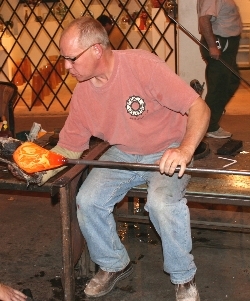 The process of cutting glass is laborious, and physical. The outcome is work seldom seen in the glass art medium. As I have noted above, the Ascension in my personal life started this process. Since I started carving glass, I see the Ascension of my glass to another level in its life. While blowing glass, there is an excitement of the alchemic transformation from liquid to solid. There is a direct contrast to carving glass. One of meditative and calming cuts made to the piece as it 'ascends' to the final result. I try to price my work so it is affordable. My memorials are custom made for the client. I want to talk with you as much as I can to make your memorial something truly special.